Find out what sort of prices you can expect with the market reports. 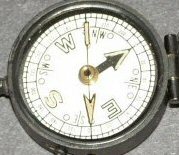 Read more about these popular compasses in the article on WWI Pocket watch compasses. Intrigued to know what all that compass jargon means. In my view Singer's Patent was an iconic design of the 1860's. So who was Singer? World War 1 prismatic compasses prove very popular at auction, but what were their origins? And finally some useful links to compass sites around the world. In the final quarter of 2013 the volume of compasses sold continued to slow down, a trend that has been seen for three quarters nos however average prices have sustained the increments achieved over previous quarters - at least there is still growth somewhere!. I have said this before and it remains abundantly clear that quality collectible compasses sell at good prices. There are still plenty of bargains out there if you want to add to your collection or are considering starting one. My forecast is that overall prices will stabilise over the next quarter, I suspect this was a seasonal effect that we have seen before. The magnetic properties of ferrous materials have been known about for well over two thousand years. Just like the wheel no one really knows who or precisely when the compass was invented. My own personal favourite contender for devising the compass was the Chinese scholar who wrote on a wide variety of topics including mathematics, music, astronomy, calendars, cartography, geology, optics and medicine - Shen Kua (1031-1095). However new research of mine showed that I was out by 3400 years! I have been reading an article by Sir William Thomson "Terrestrial Magnetism and the Mariners's Compass" dated 1874 in which he attributes the origins to the Chinese. The following is extracted from his book. "He, percerving that thick fogs saved the enemy from his pursuit, and that the soldiers rambled out of the way, and lost the course of the wind, made a carr which show'd 'em the four cardinal points; by this method he overtook Tchi Yeou, made him prisoner and put him to death. Some say there were engraved in this carr, on a plate the characters of a rat and a horse, and underneath was placed a needle, to determine the four parts of the world. This would amount to the use of the compass, or something very near it, being of great antiquity, and well attested. 'Tis pity this contrivance is not explained, but the interpreters knowing only the bare fact dare not venture on conjectures." most scrupulously revised and corrected, when necessary, by the P�re Contancin, who had spent thirty-two years in China. It is impossible to doubt but that the narrative represents accurately the traditions current in China at that time. The instrument which the Emperor Hoang Ti is said to have used cannot possibly have been anything but a compass, as nothing else could have done what it is said to have done. It is then perfectly certain that at the time when the quoted tradition originated, the Compass was known in China. We have thus irrefragable evidence that the compass was known at a very early time in China, and fairly strong evidence for believing it to have been known there as early as 2400 years before the Christian era. Sir William Thomson is probably better known a Lord Kelvin. Not only has the compass made our lives a lot safer, but today is still an essential instrument. It continues to be a constant source of fascination and interest to many people. Compass use spans everything from the toy and novelty type device to precise scientific and navigational instrument. Do a search on the internet for �compass� and you will regularly identify hundreds of items for sale. Where do all these compasses go once used, who knows? However a very few end up in my collection. A majority are invariably well used and yet still work, which I think is a tribute to those who designed and made them. They have frequently survived wars and everyday use, and many at, 100 plus years of age, are still useable today. 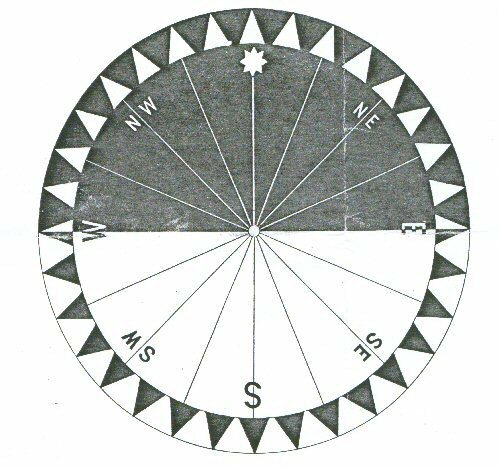 I have been collecting compasses for the last few years and this website is intended to share the research and information I gather. My collection is currently predominately English/European, but I am now developing a much broader global collection. I prefer to enter into correspondence via my own compasscollector blog or email. It is from this correspondence that I will decide on the content for future articles. So, please feel free to send me your comments, ideas, feedback and questions. My own collection spans from about the mid 18th century to date and generally I only collect compasses that can be carried around by an individual. There are inevitably one or two exceptions to this rule though. I track the market for the more common compasses in terms of prices paid and volumes sold and this material is included on the market report page. This takes up a fair bit of time so I only update the reports quarterly. The vast majority of data comes from the Internet since this makes the administration of the tracking process easier. In addition, I continue to amass a large amount of research material which I share with others. Equally I would welcome any information you can provide on the production of compasses. I hope you find this site useful and helpful and please feel free to contact me with your comments or ideas for an article for me to publish. Finally I want to thank all those who contact me about their compasses and with comments on this site, please keep them coming the feedback is invaluable. Thankyou for your continued support and please keep sending the questions and details about your compasses. Want to be listed, please send me details and I will consider listing you? � CCA Limited 2006-2014. Every effort has been taken to ensure that this Web site is accurate and up to date. No liability is accepted for problems, damages or failures that arise from using information supplied via our Web site. All other copyright and trademarks are acknowledged. compasscollector is a trademark of CCA Limited.